Clarence's Wicked Mind: my "sun jar"
A normal LED requires more than 1 AA cell to power it up. To overcome this, the center-tapped-coil and one of the transistor formed a switching circuit. It generates voltage high enough to light up the LED with less than one volt. Unlike the commercially available Sun Jar, this circuit doesn't use photoresistor to control when to light up the LED. 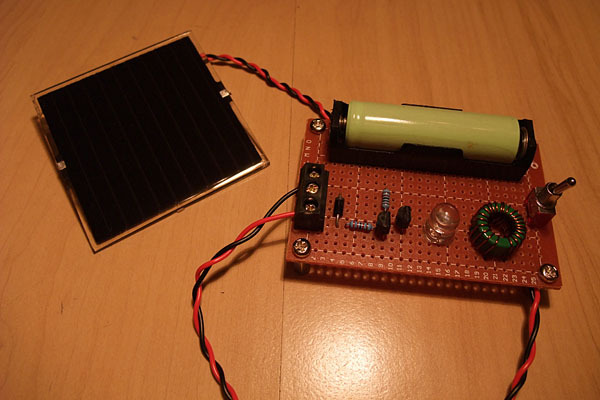 Instead, a transistor is used to detect the voltage output of the solar panel. Your video has been marked as private so it cannot be viewed. I am trying various circuit combinations that will yield the most efficient output to make a sun jar also. Thanks for posting your circuit! Hi Jay. Didn't realize that I changed the video to private. Just changed it back to public. Happy hacking!